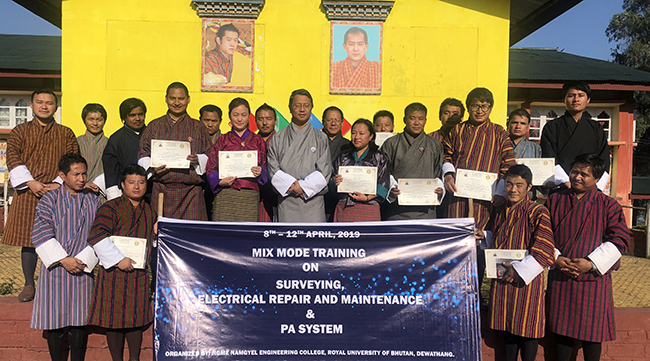 Jigme Namgyel Engineering College on request from Samdrup Jongkhar Dzongkhag Administration conducted mixed mode training titled “Survey, Safety Precaution, Electrical Repair Works & Operation of PA System” for technicians working under the Dzongkhag Administration. A 5 day training from 8th – 12th April, 2019, had 16 participants who are working under Samdrup Jongkhar Dzongkhag Administration. During the training, participants were trained on land surveying tools like Total Station and Global Navigation Satellite System (Real-time Kinematic). They were also trained on safety precautions and procedures one must observe while handling explosive at work place. Further they were also trained on repair and maintenance of electrical works and operation of PA (Public Address) system.